The new NoLIta restaurant The Musket Room is named after a nineteenth-century war in New Zealand. The menu has a pan-Asian accent and the wine list is dominated by New Zealand labels. The Musket Room, 265 Elizabeth St., New York, NY 10012, 212-219-0764. Charlie Bird, a new wine-centric restaurant on the corner of Sixth Avenue and King Street, is slated to open June 4. The menu will lean toward Italy. Charlie Bird, 5 King St., New York, NY 10012, 212-235-7133. Alain Ducasse veteran and chef of Brasserie Cognac, Florian V. Hugo, will open an Upper East Side outlet, Brasserie Cognac East. The menu will be similar, serving up classic Gallic delights. Brasserie Cognac East, 963 Lexington Ave., New York, NY 10021, 212-249-5100. Part of the Blue Ribbon family of restaurants, 60-seat Blue Ribbon Beer Garden is a beer mecca in the old Kanpai Garden space. Menu items include plenty of barbecue and seasonal vegetables. Blue Ribbon Beer Garden, 190 Allen St., New York, NY 10002, 212-466-0404. Mira Sushi & Izakaya serves up creative and modern Japanese fare, as well as sushi. The top toque is Telepan alum Brian Tsao, and at the sushi bar is Owen Wu, who has logged time at Nobu 57. Mira Sushi & Izakaya, 46 W. 22nd St., New York, NY 10010, 212-989-7889. New to the Lower East Side is Preserve24, offering a menu focused on fresh New York-inspired fare, such as oysters, Long Island scallops (paired with pork belly) and a grass-fed burger. Preserve24, 177 E. Houston St., New York, NY 10003, 646-837-6100. Opening in the old Fiamma space in SoHo is Michael White's latest venture: Costata, an Italian restaurant with an emphasis on fine dining. The menu leans heavily on steak, but there are also some seafood options, including lobster cocktail and numerous types of crudo. Costata, 206 Spring St., New York, NY 10012, 212-334-3320. Newcomer One Twenty-Two First Avenue is not exactly easy to find, which makes it appealing to New York diners who like to "discover" hidden restaurants. Tucked away behind South Brooklyn Pizza in the East Village, the place serves pizza, Italian-American classics, and craft cocktails. One Twenty-Two First Avenue, 122 First Ave., New York, NY 10003, 212-533-2809. From the people who brought you Tocqueville and 15 East comes The Fourth, a spacious restaurant where Gilt alum Michael Davis is in the kitchen. The Fourth will serve breakfast, lunch and dinner. The Fourth, 132 Fourth Ave., New York, NY 10003, 212-432-1324. Harlem Shake, named for the dance and recent internet meme, is slated to open May 16 at W. 124 St. and Lenox Ave. The restaurant will serve --- wait for it --- shakes, as well as burgers, hot dogs and fries. Harlem Shake, 100 W. 124th St., New York, NY 10027, 646-508-5657. For those New Yorkers who frequent the Hamptons --- you know who you are --- there's a new restaurant in town. Enter Delmonico's of Southampton Est. 1837. The menu, which leans heavily toward seafood, incorporates vegetables and ingredients from the restaurant's on-site garden. Delmonico's will be open year-round. Delmonico's of Southampton Est. 1837, 268 Elm St., Southampton, NY 11968, 631-283-0202. Fancy cocktails and expensive bites are what's happening at the Greenwich Project, a new spot from the people who brought you Mulberry Project and Vinatta Project. The food menu leans toward the Mediterranean. Greenwich Project, 47 W. 8th St., New York, NY 10012, 212-253-9333. Elaine's, the legendary Upper East Side restaurant at Second Ave. and E. 88th St., which closed after its eponymous owner passed away, is getting a resurrection. In September, The Writing Room (a reference to the writers who would haunt Elaine's) will open up in the space. Little Prince, a new 38-seat restaurant in SoHo, serves up classic Gallic delights with desserts and chocolate by Jacques Torres. Little Prince, 199 Prince St., New York, NY 10012, 212-335-0566. ABC Cocina, an off-spring of Jean-Georges Vongerichten's wildly popular ABC Kitchen, has opened up in Manhattan. As the name suggests, the menu looks to Spain and Latin America with dishes like mezcal-cured salmon and variations on the theme of paella. 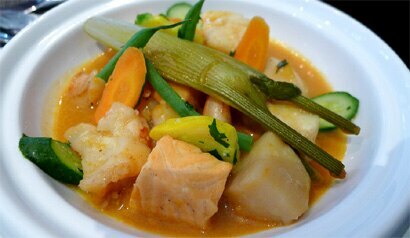 ABC Cocina, 38 E. 19th St., New York, NY 10003, 212-677-2233. Wylie Dufresne's popular new East Village eatery Alder had a no-reservations policy. But that’s no longer the case. The restaurant now sets aside a few tables per night for diners with reservations. Which should make it slightly --- though not much --- easier to get a table there. Alder, 157 Second Ave., New York, NY 10003, 212-539-1900. It's just been announced that chef Michael White is following in the footsteps of many of his Big Apple peers by opening a restaurant in London. Keith McNally and Daniel Boulud have done the same. The Resurrection of Governor. Sort of. A few alumni from db bistro moderne have announced they'll be opening a restaurant in the space that formerly housed Governor (15 Main St.), which was taken out and shut down permanently by Hurricane Sandy. The Dumbo, Brooklyn, restaurant will be open this summer. Mira Sushi & Izakaya in Chelsea/Flatiron is now serving brunch on Saturdays from noon to 4 p.m. Look for Japanese and Korean inspired brunch-time dishes. Mira Sushi & Izakaya, 46 W. 22nd St., New York, NY 10010, 212-989-7889. The New York City Wine & Food Festival won't happen until October, but festival organizers have already released the line-up. It includes dinner events by Daniel Humm, Ivan Orkin, David Bouley and Bill Telepan, among many others. There will also be appearances by a slew of Food Network talent. The festival will take place October 17-20. For more information visit www.nycwineandfoodfestival.com. Executive chef Sylvain Harribey of Gaby Restaurant Francais at the Sofitel New York has launched a new "De-Light" menu featuring tasty low-calorie options. Start off with the citrus wild arugula salad ($11, 103 calories) or Atlantic smoked salmon "Two Ways" ($18, 174 calories). Main dishes include the Fisherman "Marmite" ($29, 298 calories) with monkfish, scallops and shrimp poached in a lobster bouillon with baby fennel and vegetables, and natural chicken breast roasted with Dijon mustard, apples, dried cranberries and honey roasted baby carrots ($26, 279 calories). Gaby Restaurant Francais, Sofitel New York, 44 W. 45th St., New York, NY 10036, 212-782-3040. New York did well at this year's James Beard Foundation Awards, held Monday, May 6, at Lincoln Center. Among other Big Apple winners, Mission Chinese Food's Daniel Bowien took home Rising Star Chef of the Year; David Chang of NYC's Momofuku Ssam Bar and Paul Kahan of Chicago's Blackbird were both awarded Outstanding Chef; and Blue Hill won for Outstanding Restaurant. Maialino has recently introduced a late-night menu. After 10:30 p.m., there's an off-menu Black Angus burger, plus $5 beers and $8 Negronis. Maialino, Gramercy Park Hotel, 2 Lexington Ave., New York, NY 10010, 212-777-2410. With the Netflix premiere of the new season of cult-ish "Arrested Development" on the horizon, a pop-up frozen banana stand that is often in scenes in the show is about to appear in New York City. And not just any banana stand. This is Bluth's Original Frozen Banana. A location hasn't been announced yet but the giant banana should be appearing in the Big Apple sometime in May. Koi SoHo is movin' on up. Sort of. The restaurant, located on the ground floor of the Trump SoHo New York, is taking over the space occupied by Bar D'Eau on the seventh floor, which has fountains and an outdoor deck. Cocktails and some dishes from the main menu will be served. Koi SoHo, Trump SoHo New York, 246 Spring St., New York, NY 10013, 212-842-4550. Heston Blumenthal has been dropping some hints that he'd like to open an outpost of his popular London restaurant, Dinner by Heston Blumenthal, in New York. There's no word yet on how serious the chef is or where exactly he'd open in the Big Apple. Chef Justin Bogle, most recently of the shuttered restaurant Gilt, is headed to Philadelphia to open a restaurant in the main dining room of Le Bec-Fin, which will close in June. The name has not yet been announced for Bogle's project, but it will feature a contemporary American menu. Former Gusto chef and contestant on "The Next Iron Chef" Amanda Freitag is reportedly opening a restaurant in the space that formerly housed Empire Diner. Debuting at the end of summer, the newcomer will serve diner fare made with locally sourced products. Eleven Madison Park former senior sous chef David Nayfeld has left that restaurant to open up an eatery of his own in Los Angeles. Eleven Madison Park, 11 Madison Ave., New York, NY 10010, 212-889-0905. The Upper East Side's 83 1/2, once the short-lived home for chef Ryan Skeen, has a new toque: Will Foden, who comes from BiNA Osteria & Alimentari in Boston. 83 1/2, 345 E. 83rd St., New York, NY 10028, 212-737-8312. Missy Robbins, who has been the chef at A Voce for the last five years, has left both the Madison Avenue and the Time Warner Center locations. There's no word yet on who will replace her. A Voce, 41 Madison Ave., New York, NY 10010, 212-545-8555. Second Avenue French restaurant Les Sans Culottes has shut down. Les Sans Culottes, 1085 Second Ave., New York, NY 10022, no phone. After just a year and a half in business, the Bowery outpost of Ukrainian diner Veselka has closed. Veselka Bowery, 9 E. 1st St., New York, NY 10003, no phone. Ciano, the Italian restaurant in the Flatiron District, has shut down. Ciano, 45 E. 22nd St., New York, NY 10010, no phone. Stand, the above-average burger spot on E. 12th Street, has shut down its grill and closed. Stand, 24 E. 12th St., New York, NY 10003, no phone. The Ninth Avenue location of Pop Burger has shut down. Other locations sprinkled around the city remain open, including Pop Pub on University Place. Pop Burger, 58-60 Ninth Ave., New York, NY 10011, no phone.